Instantly create a public HTTPS URL for a web site running locally on your development machine. Set http auth credentials to protect access to your tunnel and those you share it with. Share your real-time web apps! ngrok tunnels websocket connections over HTTP tunnels without any changes. Easily develop webhook integrations by simply 'replaying' webhook requests to your dev server. Dynamically start, stop and query tunnel status all with a simple RESTful API. 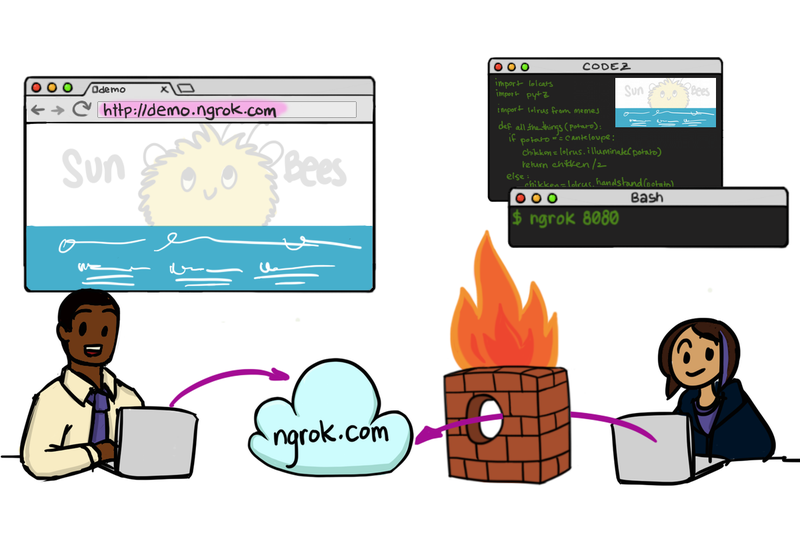 Use ngrok's web inspection interface to understand the HTTP request and response traffic over your tunnel. Don't configure port forwarding on your router or waste time setting up dynamic DNS solutions. ngrok works everywhere with no changes, even when a device changes networks. Expose any networked service to the internet, even ones that don't use HTTP like SSH. Run multiple tunnels simultaneously with a single ngrok client. Rewrite the Host header of tunneled requests to target a specific site in your WAMP/MAMP/Pow development environment. Accounts can share access to reserved domains and addresses allowing multiple developers to collaborate on a project while still having their own credentials. Some features of the ngrok service are only available to customers using one of the ngrok.com paid plans. Features only available on paid plans are enumerated below. Your app will appear on https://myapp.ngrok.io instead of on a randomly chosen subdomain. Run tunnels over your own domain names! This requires a simple change to your DNS. Reserve a unchanging IP and port exclusive for your use. Perfect for personal cloud services or anything you expose via ngrok TCP tunnels. Tunnel HTTP requests for all of your subdomains to a local service with just a single command. Reserve your ngrok.io subdomains so that they are never provisioned to another user and are always available for your use. Tunnel HTTPS (or other TLS) traffic to your local services end-to-end encrypted with your own SSL certificate and private key. You can even run them over your own domains! Use ngrok's TLS tunnels with end-to-end encryption even if your local service doesn't support TLS termination by offloading it to the ngrok client! Whitelist access to your tunnel endpoints by IP address or IP range for additional security of your tunneled services. Can I programmatically manage hundreds of ngrok processes or more? Yes. ngrok link is a set of custom plans and additional features that allow you to use ngrok to manage connectivity to hundreds or thousands of devices or for targeted access into customer networks as a lightweight alternative to VPN. Contact sales@ngrok.com for more details. Can I run my own ngrok server? Yes, kind of. You may license a dedicated installation of the ngrok server cluster for commercial use. You provide us with keys to an AWS account and we will install the server cluster software into that account. We then provide on-going maintenance, operations, updates, monitoring and support for your dedicated cluster. Please contact sales for further details. It is not currently possible to license an on-prem version of the ngrok software to operate yourself, although feel free to get in touch if you're interested in that. You'll be up and running with ngrok in less than a minute.